Baroque architecture was used in secular buildings as well. Impressive Baroque palaces completely changed the face of the 18th-century Bratislava, which was a coronation city and the place where the Diet of Hungary met. 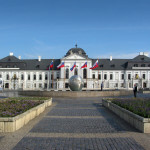 The most significant change was the extension of Bratislava Castle – a palace called Terezianum was added. It was designed by F. A. Hillebrandt and it was owned by the joint Governors Albert of Saxony, the Duke of Teschen and his wife Maria Christina, Duchess of Teschen. The city itself and its outskirts were also affected by intensive construction activities. The most notable investors were the Pálffys and the Esterházys, who at that time belonged to the elite of the Hungarian nobility. They were later joined by other Hungarian families involved in the public affairs of the country that needed to gain publicity by investing in Bratislava. Their palaces were strongly influenced by Viennese architecture. One of the most beautiful 18th-century palaces in Bratislava is the three-winged Esterházy Palace on the Panská Street. Its main entrance contains a dynamically shaped portal with a pair of atlantes. Another remarkable building is the Pálffy Palace on the Ventúrska Street. Atlantes can be also found on the portal of the Hungarian Royal Chamber Palace situated on the Michalská Street. The palace was most likely designed by Giovanni Battista Martinelli and was finished in 1756. It was used for representational and administrative purposes. 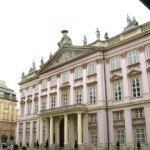 The last Baroque palace built in Bratislava was the Primate’s Palace. It was built from 1776 to 1781 and designed by the architect Melchior Hefele. The palaces located in the town had to copy the town plan, i.e. they were limited by the town layout. However, it was possible to build large palaces on the outskirts – e.g. the palace of Count Anton Grassalkovich and the palace of Count Gobert of Aspremont. These vast palaces were constructed together with Baroque gardens. The architecture of these summer residences naturally interconnected interior with exterior. One could look at the garden through windows and vice-versa or enjoy sitting on terraces, balconies or the so-called sala terrena – a large room with direct access to a garden gained by one side being open to that garden. Presumably, the oldest preserved sala terrena in Slovakia can be found within the Červený Kameň Castle. The room was built in the middle of the 17th century on the initiative of Mikuláš Pálffy and it was designed by Viennese architect Filiberto Luchese. The country houses gradually adopted the open space concept as well. Typically, they had four wings, one of which was partially open to the garden. This is also the structure of the manor houses in Veľký Biel or in Bernolákovo. Both of them were designed by Anton Erhard Martinelli at the beginning of the 18th century. These manor houses are characterised by a main entrance bay with a tower-like superstructure, towers on the corners, richly decorated portals, and round, or rather oval window openings placed above the ledges on the first floor. Moreover, they have interior high mansard roofs with impressive dormer windows. The interiors are full of great vaulted rooms, halls with ornamental plaster pilasters, impressive staircases with balustrades and baroque sculptures. Both manor houses belong to the most significant baroque buildings in Slovakia.